'It's like the Garden of Eden,' our guide says, 'just beautiful...' and we draw up our reins to marvel in silent reverence at the vast landscape, dotted with every wild animal we could have hoped to see. Across this lush, buzzing vista, buffalo herd around impala, eagles soar above wildebeest and elephants charge fruit trees, while lions wait patiently in the tall savannah grass deciding which to eat for dinner. 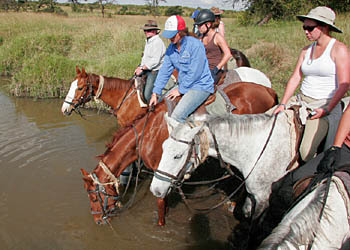 Getting to Offbeat Safaris is not easy... it takes days of hard riding to earn a seat at this show. Our journey begins in the capital, Nairobi, where we transfer through gridlock traffic to a domestic airport and board a 12-seat Cessna, heading south-west over the Loita Plains, above the Kikuyu Highlands and past the volcano-studded Great Rift Valley. An hour later we’re bumping down on a dirt-strip that doubles as a gateway to the reserve and a social hotspot for colourfully-dressed Masai warriors. With no phone signal and no electricity from here on in, it also represents the eye of a needle through which few First-World foibles may pass. From here, a Land Rover bumps us along remote red dirt roads to a campsite set in a grove of acacia trees. This would be the first of three such sites, and traversing between them for up to six hours a day on horseback will require every inch of riding skill I have. There's barely time for a cold Kenyan Tusker beer before we're heading out on our first ride when the sun hangs low enough to bring the wildlife out to feed. Here the guides quietly make their assessments about our riding abilities and how closely they need to stick to us, and whether we've been paired with the right horse. They’re an international bunch; a half-Argentinian, half-Austrian lifer (he started working with Offbeat at 18, and he's still there aged 33), an Australian polo player from Dubai, a British safari guide from Botswana, and a student volunteer and hunter from England. The guests were from the UK, US, Germany, Italy and Australia. The horses are Abyssinian, thoroughbred and cross-thoroughbreds, reared on the owner's farm, and brought into the reserve via a seven-hour horsebox slog. Mine was a pristinely-turned-out, polo-playing gelding named Blondie, looking decidedly bling with his dash of gold flecks and bright yellow mane. After half an hour of sizing each other up at the beginning, we knew we’d get on fine. Being confident on your horse could be the most important part of this adventure. Over the next week, we would inch – day-by-day – ever closer to prides of snarling lions, square up to scrappy elephants and push back short-tempered Cape buffalo... any of which could outrun us, if they wanted to. Being comfortable riding in English tack is important too, as I noticed the countryside Californians in our group had a hard time adjusting to the bolt-upright British saddles at odds with the Western-style 'armchairs' they use back home. The most accomplished riders tail the lead guide as he opts to take the most daring routes, jumping over felled trees left by head-charging pachyderm and playing chicken with lions which may or may not have eaten that day. Every two to three days, camp packs up and shifts by truck; with its canvas dining tent, shower, sleeping and toilet tents resembling a well-appointed commune when pitched at each of the three stunning oases. On every ‘moving’ day, there is an epic ride to reach the next site, which can be up to 50 kilometres away. That's a lot of riding – at high altitude – across challenging terrain, galloping across plains pockmarked with aardvark holes and rocks, and cantering through stone-bed rivers with vertigo-inducing banks. Along the way, animal burrows are a constant hazard. But if you're lucky enough for the person in front of you to spot one through the dust clouds, avoid it and shout 'HOLE!' in time, you might not fall down it. Organisers encourage guests to take out medical insurance prior to arrival, but they also have their own public liability insurance and membership to the Flying Doctors organisation, in case of serious injury requiring evacuation. Nevertheless, there's a lot that can go wrong in the middle of nowhere. The riding sections will undoubtedly push you to your limits of self-preservation, whether you opt to take the easy option and stay back, or throw caution to the wind and try to keep up with the lead guide. Bullwhips protect guests from animal attacks, with guides normally carrying little else. 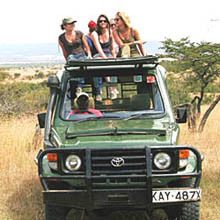 The Land Rover variant of the trip, for non-riders, encourages guests to get out and walk on the reserve, and here, they are accompanied by a guard carrying a rifle. The one occasion we went out armed was to a mountain we climbed first by car, then by foot to reach its spectacular peak. Its nooks host several families of cheetah and leopard, which we were warned to be on our guard against, although we didn't see any as we clambered about on its slopes. On our first night at the third campsite, while drinking beers around the fire on the banks of the Mara River, our lead Masai guard, Nati, came over saying he’d spotted a cheetah and asking if we wanted to see it. Several seconds later we were careening around the site in the Land Rover, shining a spotlight until suddenly we caught a flash of markings bolting into a bush. Nati picked out an impala with the light, leading the cheetah out into the open to its quarry. The kill was artistic and eloquent in its execution and despite the graphic scene, we drove over, clutching our beers on the roof of the car, and sat transfixed to watch it feed. Other night-time highlights included Masai warriors demonstrating their mating dance around the fire (a hit with the ladies), driving out to party on the plains after dark with James Brown booming from the stereo, and running semi-clothed out of my tent at 4am as an elephant pushed down a nearby tree. Returning to my tent after dinner each evening, I would without fail find my riding boots cleaned and polished to perfection and my laundry scrubbed, pressed and folded as if at a top-notch hotel. The food and drink was impressive too, an array of cuisine cooked up from fresh, imported and locally-produced ingredients... ‘Would you like your steak rare or well-done... with a nice Malbec or a Bloody Mary?’ and ‘Breakfast eggs fried, scrambled or poached?’ Riding for hours from the crack of dawn to emerge over a hill and find the camp’s chef cooking breakfast for you, and baking fresh bread – in the middle of the plains – also ranks, for me, as a new definition of decadence. Our midday siestas in shady glades after picnic lunches were something to savour too... like falling asleep on the classroom rug after having your fill of milk and biscuits at kindergarten. At the end of the week, it was with some sadness that I watched my fellow guests leave; while I moved on to see the company's guest lodge, another hour’s flight west. The lodge at Sosian Ranch, the Samburu word for 'Wild Date Palm,' combines the tame with the wild. It's certainly a stark contrast to Masai camping, with its solid stone guest houses, swimming pool and main house that harks back to colonial days with a snooker table, grand piano and library. 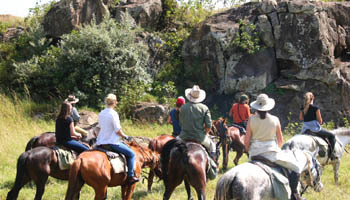 Whereas the riding trip guests were in their 20s and 30s, the game lodge guests were mainly parents in their 40s and 50s with young children. For many visitors, Sosian will perhaps be the better-fitting choice, offering a quieter, safer and more luxurious bush experience on its 24,000-acre private working ranch, set on the Laikipia plateau. It’s a beautiful area that offers more than 250 species of birdlife and an abundance of game species with four of the big five species being found there, plus other rarities such as wild dogs, Jackson’s hartebeest and Grevy’s zebra. Nonetheless, I’d be back on the mad travelling horseback safari circus any day... at least for another few years. 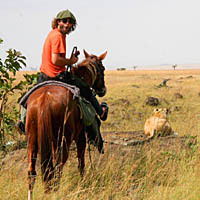 Cross the Masai Mara with Offbeat Safaris on horseback over 7 nights from $5,550/£3,550/€4,400 or 10 nights from $7,700/£4,900/€6,075 per person (Jan-Mar, Jun-Oct & Dec), excluding international flights. Non-riders can take a Land Rover safari from $6,500/£4,050/€5,020. Or stay at Sosian Lodge from $4,500/£2,800/€3,470 per week, per person. Richard Powell is a freelance journalist who also works for the Press Release Distribution, Media Monitoring and Public Relations firm, Presswire, but does not work with, or for, any of the parties mentioned in this article.